Spring is hope born anew. Be the hope! 100% public donations go to our programs. not to overhead. At Heaven on Earth NOW, our mission is to . . .
1 in 7 Americans struggles to put meals on the table. Too often, they resort to eating junk that fills them up but undermines their health. 100 percent of your donation will go to providing healthy food for hungry families. Give $20 and feed a family 27 nutritious meals with our Good for You Grocery Bag. Emerging from homelessness or crisis, most families in our Begin Again program who are placed in new homes have nothing, just the clothes on their backs. 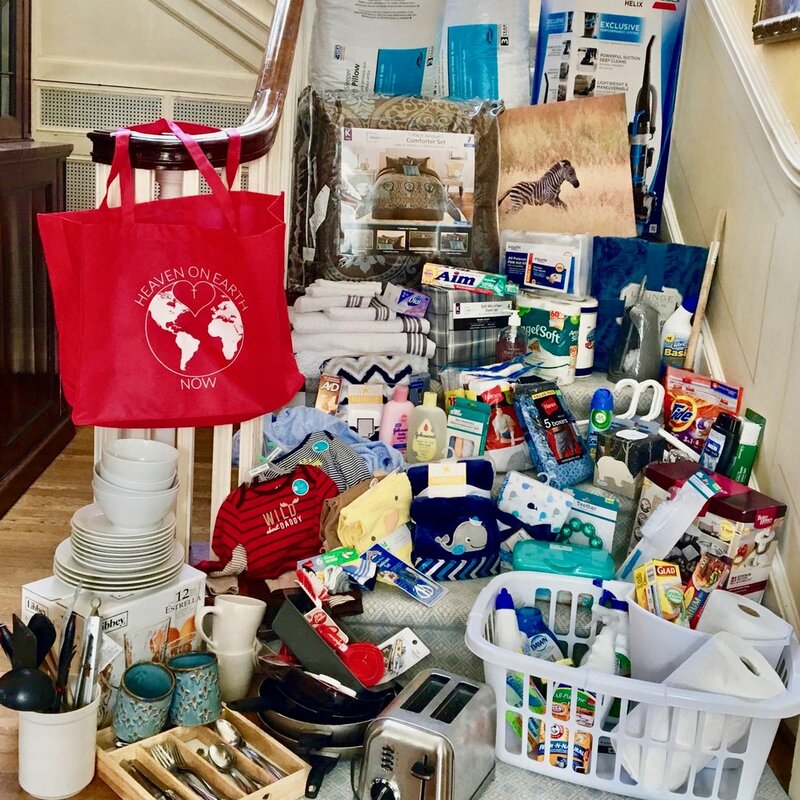 100 of your donation provides dishes, cleaning supplies, linens, and other household essentials. Give $350 and help a family make a fresh start. Why are our programs so important? 1 in 7 Americans struggle with hunger, relying on food pantries and soup kitchens to survive. We are determined to better nourish our neighbors, by providing fresh farm produce and other healthy staples and by transforming food drives in the United States. Individuals and families emerging from homelessness and crises have next to nothing when they are placed in new residences. We launch them into independent living with housewares and essentials that turn a house into a home. 1 in 10 people on earth live without access to clean water (2018). We promote the healing benefits of water and together with partners, build water wells in developing countries. The three biggest threats to world health are a lack of clean water, nutrition, and exercise. Our education efforts focus on instilling these life-transforming habits. a fresh start in life. We fed 210,000 people healthy food. With our help, 555 people made new beginnings. Private donations cover operating costs so 100 percent of your gift goes to people in need. We are a volunteer-run nonprofit. Our compassion drives us to keep solutions simple and expedient. We partner with existing organizations to stretch your dollars and deepen our impact in communities — in cities and towns across America and the world. 2230 individuals and families honored. Countless others served. "We have visited homes where people were so apologetic because there were no chairs. . . now we see that our families have dignity. More than any material item, you gave them a mirror to see their value and worth. Many of our families have not had positive life experiences, so for them to be seen and then known…well, it means more than you can know." Tens of thousands learned healthy habits. Millions taught to better nourish their neighbors with healthy food donations.